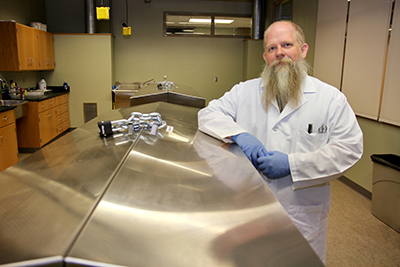 MINOT, N.D. – Minot State University students will have a unique opportunity to study the human body as the university officially opened a cadaver lab to enhance its Biology 220 and 221 Anatomy and Physiology I and II classes. There are strict rules and regulations that accompany the new cadaver lab. According to Ament, the experience gained through working with cadavers as opposed to plastic models is immeasurable. While Ament believes his biology students will leave Minot State better prepared for their next level of school, he also feels other disciplines within the university will benefit from the class. And, for the biology students – especially the individuals interested in a pre-medical field – there are real advantages to working in Minot State’s smaller classes.